The tennis legend was publicly blamed for a man’s death, only to be exonerated thanks to TMZ. Something is wrong with this picture. My bias is real. When it comes to tennis legends Venus and Serena Williams, they have never been just athletes to me, but people. Like many others I have felt an imperative to defend against their detractors, know-nothings, and dime-store bigots. The reasons are obvious: they were once two black teenagers from the public courts of Compton, treated with contempt—of both a race and class variety—by their sport and they not only survived but thrived. Over the last two decades, as the Williams sisters have moved from champions to icons, my knee-jerk defensive posture has moved decisively toward older sister Venus. No matter what gasbags like John McEnroe and his mainstream defenders belch, Serena is securely recognized as one of the great athletes of the last century, with legions of fans and 23 Grand Slam singles titles to show for it. As this photo demonstrates, she is the queen. But Venus, who at 37 is still bludgeoning opponents half her age, has not won a Grand Slam title since 2008. This is best explained not only by her sister’s dominance but also the fact that she was diagnosed with Sjögren’s Syndrome in 2011, a brutal autoimmune illness affecting the joints and causing fatigue. It is a disease defined by chronic pain. The fact that she continues to take the court and win matches has created a different kind of iconography than the one crafted by her sister. That is why the treatment of Venus Williams by the Palm Beach Gardens, Florida, police department over the last week has made me want to run to the nearest barricade. This story begins with unspeakable tragedy. On June 9, 78-year-old Jerome Barson was killed and his wife, Linda, terribly injured after Ms. Williams’s SUV—going five miles per hour—entered an intersection, colliding with the Barsons’ car. The immediate public statements by police, before any kind of investigation was completed, claimed Williams was “at fault for violating the right of way.” They recklessly announced to the world—in our low-information, 140-character celebrity culture—that Venus Williams had effectively killed an elderly man. yeah. I’m completely speechless. It’s just…” Then she put her head in her hands and left the podium before returning, a hybrid of frayed nerves and steely resolve, to complete the interview. After all of this, the Palm Beach Gardens police issued a statement basically saying “Whoops.” While the investigation is still ongoing, police now say that Williams was driving lawfully in the intersection, which video released by TMZ appears to confirm. 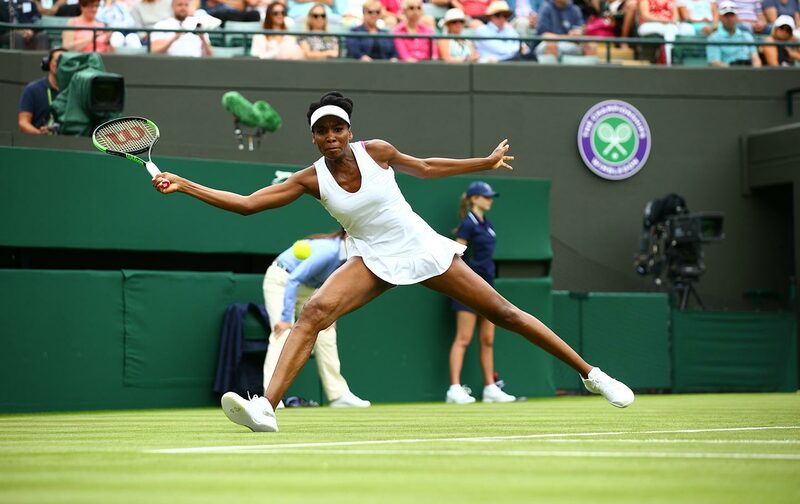 Amid this trauma, Venus has advanced to the second weekend of Wimbledon, defeating Naomi Osaka, a 19-year-old player who was not even born when Williams first took to the grass courts 20 years ago. Her ability to persevere is stunning, but this is not a game. There is something very wrong about this entire scenario in Palm Beach Gardens. For the police to state publicly that Venus was responsible for this death in advance of the facts is a gross dereliction of duty by the department. Palm Beach Gardens is a place of gated communities, luxury golf courses, and wealth. Both Williams sisters call it home. It is difficult to imagine a scenario where other high-profile Palm Beach Gardens residents—such as pro-golf star Rory McIlroy—would be treated in such a way. This isn’t about Venus Williams’s “deserving better.” It’s about how police departments treat black women in this country. Even living in one of the Palm Beach Gardens gated communities does not offer sanctuary. It will be more than understandable if Venus Williams just wants to get on with her life and put this ordeal behind her. But if she attempts to publicly challenge how the Palm Beach Gardens police handled this case, she won’t be walking alone. Correction, July 12, 2017: Venus Williams issued her Facebook statement before her July 3 Wimbledon press conference, not afterwards as an earlier version stated. Serena Williams holds 23 Grand Slam singles titles, not two dozen.